Following his education at the Beaux Arts de Toulon and the Academie de Peinture de Ia Ville de Paris, Guy Buffet's paintings gained international acclaim. Guy Buffet later served in the French Navy as the official artist, allowing him the opportunity to paint throughout the world and document a wide variety of cultures. As a young man, Buffet's work was displayed at the museum of the French Navy at Toulon. During Buffet's travels to Hawaii Guy Buffet fell in love with the cultural history and folklore of the state and its people, so much so that he decided to live there. His fascination and subsequent move resulted in several commissions and mural work which contributed to his escalating fame. In 1981, Guy Buffet was invited to travel China as guest of the Peking Arts and Crafts Council and represent his experience through paintings. The works, entitled Guy Buffets China were later exhibited in Honolulu. In 1989, Guy Buffet was internationally recognized for his exhibition with the Monnaie de Paris. The theme involved the Bicentennial of the French Revolution and the Declaration of the Rights of Man. It began in Paris, France, and traveled to most major cities in the United States and Canada, concluding in Tokyo, Japan. 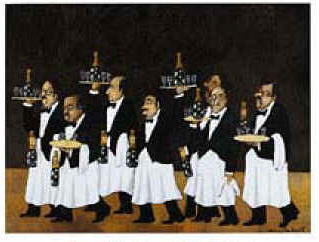 Guy Buffet has been honored in many different ways through shows such as Art et Prestige and Lahaina Gallery Exhibits. As a result of his restaurant series entitled Great Restaurants of America, he was represented by such sponsors as Absolut Vodka, the Westin Hotels, and Grand Mariner.